Local politicians have reacted to the attempted murder of a police officer in Derry by describing those responsible as 'enemies of the Irish people' and 'criminals' with nothing to offer the people of the North West. Speaking after PSNI Superintendent Gordon McCalmont said he believed violent, dissident republicans tried to kill a colleague this morning, SDLP leader Column Eastwood said those behind the attack were enemies of the Irish people. “The cowards who targeted a police officer this morning have set themselves against the people of Derry and the people of Ireland. They are enemies of the Irish people," he said. "Their malicious and murderous attempt to bring violence back to our streets has failed before and it will fail again," said Mr. Eastwood. "Those responsible for this attack have nothing to offer the people of Derry or the north. "They do not represent the views of the city and they need to call a halt to these futile actions imediately." DUP candidate in Foyle, Gary Middleton, said: "These are despicable acts which endangered the lives of innocent people who simply go about their everyday routine. "The intentions are to drag Northern Ireland back into the past by instilling fear and intimidation." And Julia Kee, a candidate for the UUP, said: "Once again we have been reminded that the threat posed by criminal and terrorist elements in Londonderry is very real. 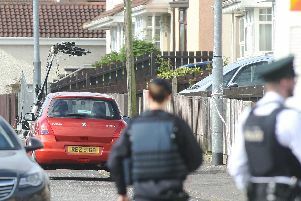 “Whoever planted the device under a car outside the home of a police officer in Ardanlee, Culmore, was not only trying to kill that officer, they were also sending a message to the wider community in a bid to create a climate of fear."